This book has arisen from the Second European Meeting on Bacterial Genetics and Ecology (Bageco-2) held at the University of Wales, College of Cardiff which we organised on 11-12 April 1989. The meeting was attended by some 60 participants from eight European countries and was made possible by partial financial support from the Commission of the European Communities (CEC) and Imperial Chem­ ical Industries (UK) Ltd. The meeting was organised to discuss modern developments in the genetics of bacteria in aquatic and terrestrial habitats. It followed on from, and complemented, the first meeting of this series organised by Jean-Pierre Gratia in Brussels during April 1987 which concentrated more on medical and epidemiological issues. ! The next meeting will be organised by Michel J. Gauthier in 1991 at Nice, France. 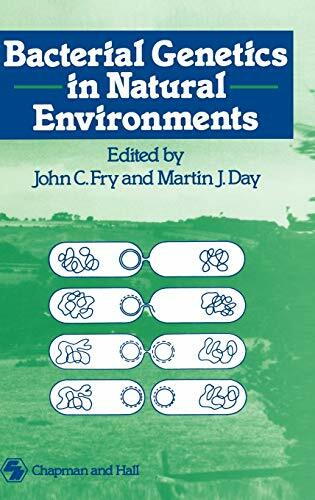 If you have been fired with enthusiasm for ecological bacterial genetics after having read this book, and want to attend the next meeting but did not hear about the one in Cardiff, you should write to Dr Gauthier to be put on the address list. A lot is now known about bacterial genetics at the physiological, biochemical and molecular level, and bacterial ecology has developed rapidly over the last 20 years. However, until very recently, few researchers have crossed the divide and linked these two specialisms.